In our effort to prevent food waste, Arps Dairy is writing a blog series about ways to use up a gallon of milk. In the first part of this series we discussed how to make your own homemade mozzarella. In this second part, we are bring you Jamie Oliver’s Chicken in Milk recipe. This delicious recipe, which uses approximately 2⅓ cups of milk, is hailed by many foodie bloggers to be the best chicken recipe of all time! So rather than pouring that last little bit of milk down the drain, try using it as this delicious chicken marinade instead! Why is this recipe so good? When you uncover the pot, the chicken will be sitting in a pool of creamy pan sauce with the milk having dissolved into small bits of curd and juice. Unlike the curdled milk that you may expect, it looks and tastes more like liquid lemon gold, bathed in chicken juices. This recipe’s appeal lies in its sheer deliciousness and simplicity, and also in its unexpected combination of ingredients and method. It’s a recipe that you think could never work — and yet it does, and that small moment of surprised delight seasons the whole dish. 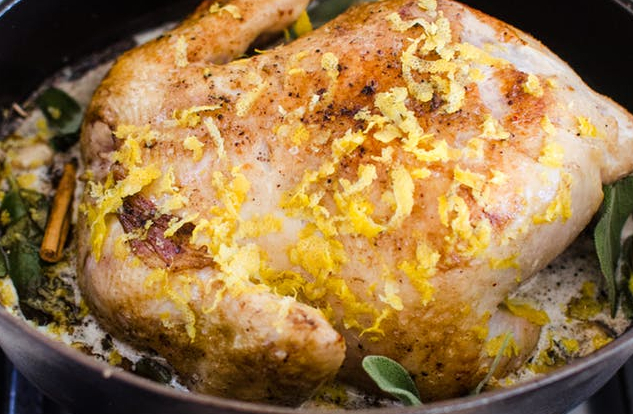 “The first time I ever made this, I had a spacey moment and glibly assumed that since I was cooking a chicken in a pot that that meant the lid should go on. I banged on a lid and put it in the oven. An hour later it hit me: was that called for in the recipe? I double checked. No. So I ran in and took off the lid for the last half hour of cooking. I tried it a second time with the pot lid off the whole time as specified in the recipe. And all things being equal, I think that the first way was better. While it was still an incredibly good dish, leaving the lid off made it taste more like a traditional roast chicken. It was less tender, and I felt like the flavor really didn’t permeate the chicken the way that it did the first time. Brown the chicken in copious amounts of olive oil and butter. Bake for 90 minutes or until thoroughly cooked, basting with the cooking juices when you remember. The lemon zest will sort of split the milk, making a sauce which is absolutely fantastic. Pull apart and eat. Spoon over plenty of juice and the little curds. Serve with wilted spinach or greens and some mashed potato, if you like.